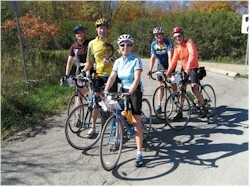 The Halton Outdoor Club recognizes that riding with others is both more enjoyable and safer than riding alone. The Club offers two cycling programs: road cycling and trail cycling. Road cyclists travel on secondary scenic roads while trail cyclists look for trails dedicated to non vehicular traffic. Our trail cycling is not to be confused with mountain biking where the terrain is often challenging and rugged; we prefer a gentler trail, usually along the area’s rail trails. Most road rides are concentrated in the Halton region while most of the trail rides take place a little further afield such as in Hamilton, Niagara or Brantford. In both cases our day trips are free; you provide the bike and the leg power and we supply the maps and the leaders. There is a separate schedule for the road tourers and the trail riders. The schedule specifies the meeting time and place for each ride. When required, route maps and descriptions are given out at the beginning of each ride. Leaders will indicate points of interest on the ride, as well as indicate any areas of caution. Whether you are a beginner, intermediate or advanced rider, there will always be someone to ride with and there will be various distances to choose from. For trail riders routes usually cover from 35 – 50 kms. For road tourers the average distance is around 50 to 60 kms. Both programs can usually provide options for longer and shorter distances to accommodate all levels of cycling. If possible we will provide a ‘sweep’ for the ride to help keep the group together, provide assistance to riders in the event of problems and to prevent anyone being left behind. Helmets are mandatory on all rides. We follow traffic regulations, we never race and we ride single file, rather than in a tight pack. Cyclists are encouraged to know how to fix a flat tire and to bring the equipment required in making simple repairs. Riders should also bring plenty of water and energy snacks on each ride. Many of the cycling trips offer a lunch stop or an optional BBQ or picnic at the end of the trip. During these social occasions you can often learn more about cycling equipment, local cycling routes and other cycling tips. During the summer months the Club offers some extended cycling trips to various locations in Canada and the States. A description of these trips along with the sign up procedures will be available in the spring and summer newsletters.